Welcome to the Official Website of the Charles County Volunteer Rescue Squad! CLICK HERE for information on CPR Classes. Congratulations to the following members on their election or appointment to their respective offices! 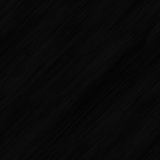 All members will take office on July 1st. 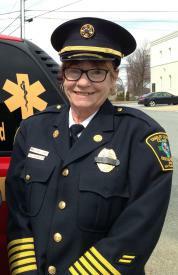 It is with great sadness and a heavy heart the Charles County Volunteer Rescue Squad announces the passing of Life Member and Past Chief Susan Grote “Nanny Goat”. Visitation will be held on Saturday, March 10th, from 9AM to 11AM, at the La Plata Volunteer Fire Department, Station 1, 911 Washington Avenue, La Plata, Maryland. 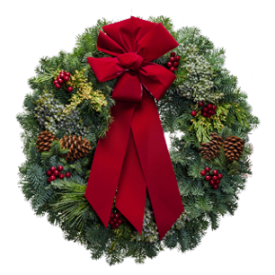 The CCVRS is once again conducting our annual Christmas Wreath fundraiser! Go to the link below and use code CCRS at checkout. The wreaths get rave reviews each year! There is a large selection of wreaths and ornaments. 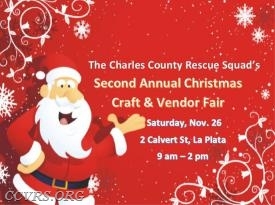 Come join us for the 3rd Annual Christmas Craft & Vendor Fair! on Small Business Saturday! Come shop and paint #ChristmasRocks! Our class is held every second Saturday of the month. 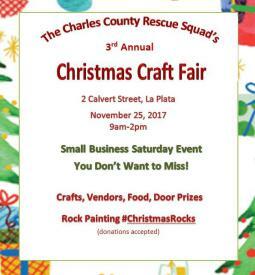 Classes are located at the squad at 2 Calvert Street in La Plata. We are located behind the old La Plata firehouse (new Board of Elections) off of Charles Street at the blinking emergency traffic light. Held on Small Business Saturday - Support Small Business and get some holiday shopping done!! 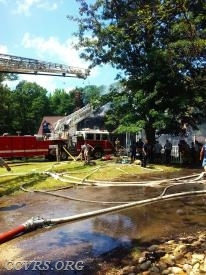 On June 12th, units from the Charles County Volunteer Rescue Squad responded to a working house fire in La Plata. Ambulance 517 responded with EMT Bobby Simpson (Driver) and EMT Kelly Raff (OIC). EMS Duty 51 also responded (Sgt. Ansell). EMS 51 units assisted with firefighter rehabilitation and management of the medical branch. The Charles County Rescue Squad was founded in 1952 with the mission to provide volunteer Emergency Medical Care to the citizens of Charles County. Today, our volunteer's run more than 2000 emergency calls a year throughout LaPlata and the surrounding areas. While our Advance Life-Support (ALS) unit is now staffed by career personnel from the County, our Basic Life-Support (BLS) ambulances', Operations and Administration functions remain entirely volunteer. If you would like to lend support to our mission by becoming a volunteer or through donation, please contact us at info@ccvrs.org or by calling 301-934-4434.